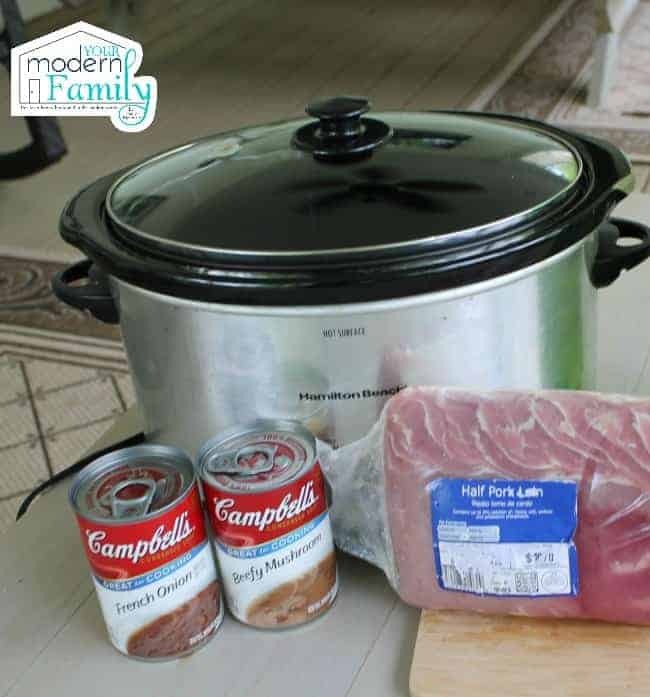 This 2 ingredient crock pot recipe is so simple. It’s Thursday afternoon, you’ve picked the kids up from school and they’re asking, “What’s for dinner?” That’s when it dawns on you that you’ve forgotten to plan dinner. Those nights are the worst! Those are the days when I wish I would have made a crockpot meal and been done before I even came home. Nearly half (49%) of moms are most likely to run out of food in their refrigerator on Thursday or earlier. 66% of moms feel stressed if they have to make an extra trip to the grocery store to buy dinner ingredients they don’t have at home. 60% of moms think that coming up with dinner ideas is more difficult than getting their children to go to bed on time. 61% of moms frequently resort to takeout or go out to eat because they don’t have the ingredients on-hand to make dinner. 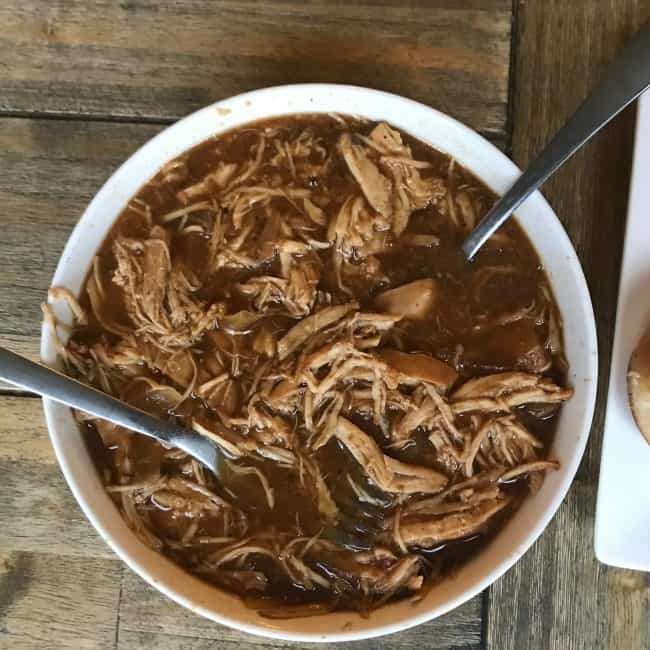 Today’s post should help with that… it’s a two-ingredient crock-pot recipe. This is a two-ingredient pork recipe. Add these to the crockpot and cook on low for 8 hours. That’s it! Cook for 8 hours, then removed & shred. You can eat it as-is or make a sandwich out of it with a roll & some cheese. When it is finished, just pair with some of your favorite vegetables. Here are the specifics that we used (dinner & then some really simple canned sides for a VERY easy meal). 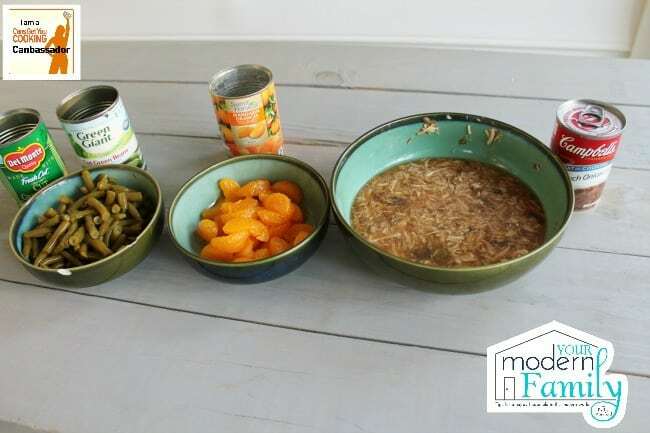 We can switch up the canned vegetables and fruit to use whatever we have in the pantry. Fresh fruits and vegetables are harvested when they are ripe (at their peak) and then they are canned within just a few hours. That makes me feel better because it means that they have locked in nutrients. It is just like the home canning process, where cans seal in the foods’ natural nutrition. 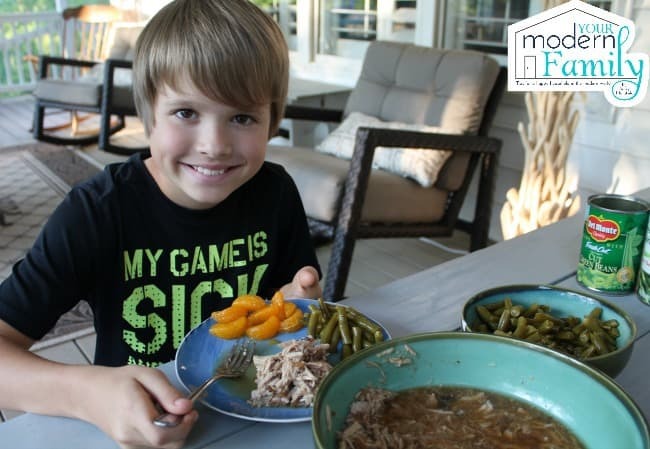 Everyone loves this dinner- it is their favorite and they ask for this at least once a week. This is the quickest meal. I hope that it helps you! When you’re done… serve up some of these 3 ingredient cookies! I can attest to French onion pork chops being delicious. My wife has been making it for years. She uses only one can but we like it less soupy. I have been looking for pork loin recipes and wondered if this would come out tough. I find that pork loin is so lean and doesn’t come out as tender as a pork with more fat. I only slow cooked one for 4 hours on low and it was tough and dry even then. Would cooking it on low for 8 hours somehow come out more tender?